Music Biz wrapped on May 17th after four days of panels, meetings and some good ol’ fashion Nashville fun. Since our last visit The Orchard announced the expansion of our Nashville team with Jess Phelps as our new General Manager. It was a very exciting week to connect and celebrate with our partners, especially in the Music City. Our team returned with new insights and a surge of energy for projects ahead. Having worked closely with Kelsea Ballerini and the Black River Entertainment team, our Senior Vice President of Content, Alan Becker, was happy to see Kelsea honored at the 60th Music Biz Awards. 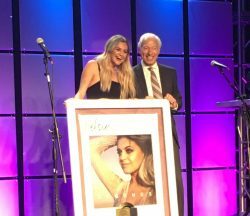 Kelsea performed at the Awards Breakfast & Presentations and was presented with a Gold RIAA plaque for “Legends” by Presidential Award recipient and RIAA CEO Cary Sherman. It was wonderful to regroup with accounts and labels in the Music City and experience what’s to come for our ever-evolving business.